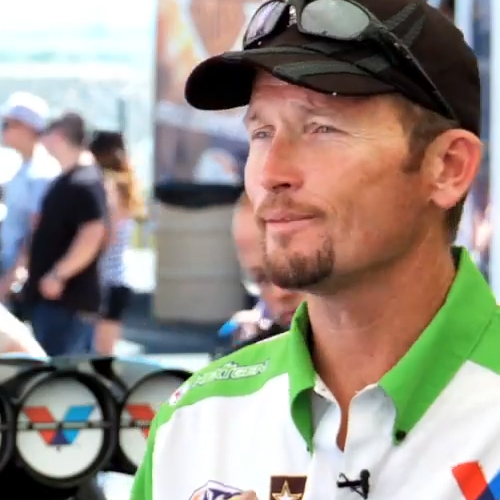 Professional drag racer Jack Beckman talks about the importance of his crew at the Bandimere Speedway in Morrison, Colorado. “Fast Jack” Beckman, who won this same race in 2007, mans the Valvoline NextGen Funny Car for Don Schumacher Racing and admits that he is only 10% of a winning team. Looking for support from his dependable mechanics and two crew chiefs to keep the car running optimally, Beckman also drew on friends and family–his personal team–when diagnosed with non-hodgkin lymphoma in May of 2004. Seven years later, he is back at the races and winning them for DSR. For more information on non-hodgkin lymphoma, visit the National Cancer Institute at www.cancer.gov.